A potent clipper will track across north-central Virginia overnight producing a period of moderate snowfall in locations just north of its track. Based on the latest high-resolution models, snow showers should develop after 9PM this evening before transitioning over to moderate snow between midnight and 4AM. Snow should begin to taper off between 5AM and 7AM from west to east. Temperatures will start out above freezing this evening but will fall into the upper 20s to lower 30s tonight with untreated roadways becoming snow-covered. Delays are likely tomorrow from the immediate metropolitan area southward to include southern Maryland and Fredericksburg. 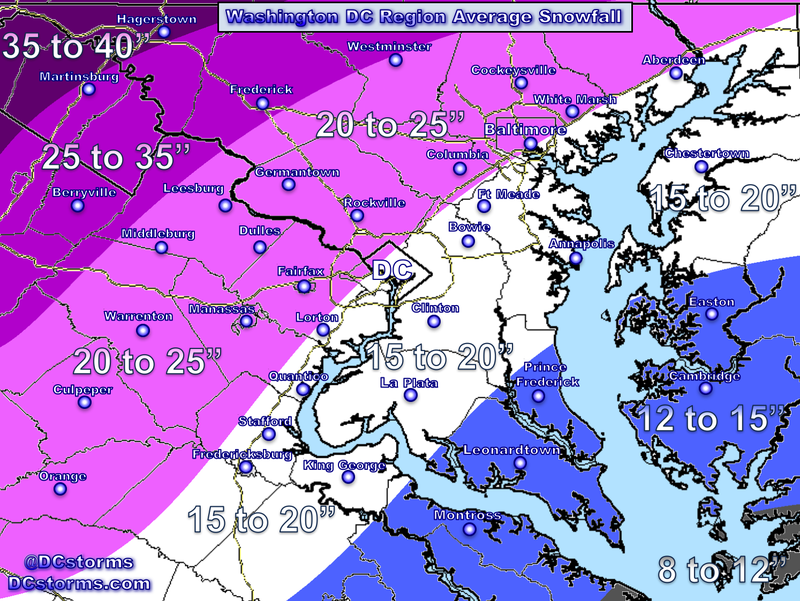 Any shift northward in track would shift the higher snowfall totals further north. 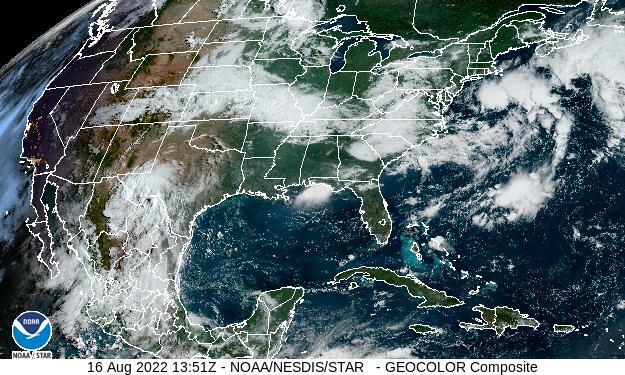 I am basing my map on a blend of the high-resolution, short-range ensembles. My current thinking is that there will be a sharp cut off to where snow falls and where it just remains cloudy. This zone of clouds with some scattered flurries is likely to be across northern Maryland and extreme northwestern Virginia. 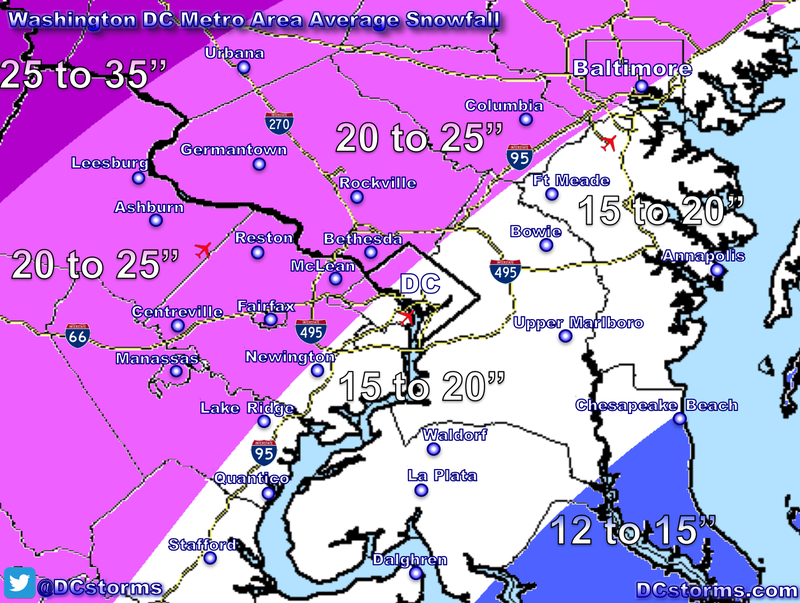 Yet again, those of you who live south of DC may end up with the highest snowfall totals of one to three inches (where my confidence is highest). 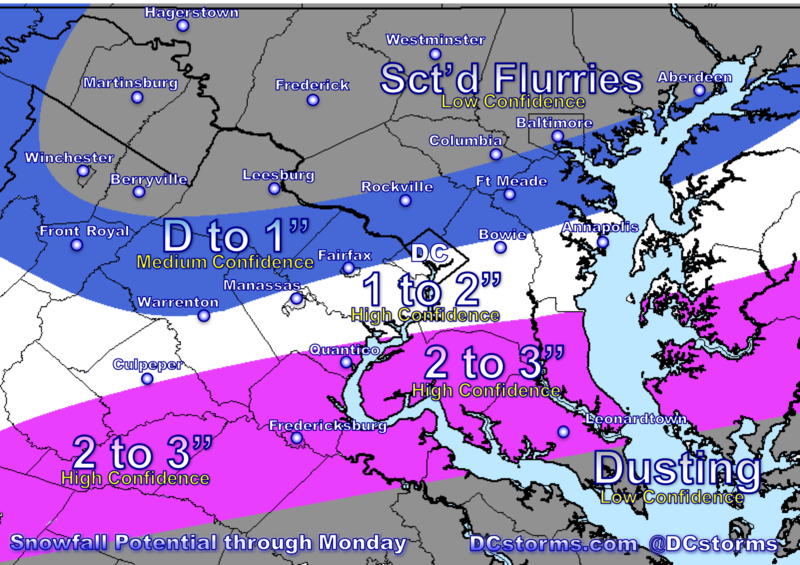 I do think that the immediate DC Area (downtown Washington, Fairfax county, Prince William county, lower Montgomery county and Prince Georges county) will likely see totals right around an inch with slick untreated roadways. Again the slightest shift north in track of even 15 miles will bring heavier snow further north… something to watch this evening. Given the situation, I wouldn’t be surprised to see the National Weather Service “eventually” pull the trigger on a Winter Weather Advisory for parts of the DC Area… they may drag their feet and wait till the 18z models come in. For those of you who work in the snow removal business, while this certainly is more of a nuisance storm, I think that your services will definitely be needed overnight. Thank you for your compliment Anthony. You and me both Andy! February is definitely looking to start out on the right footing with much colder air in place. The Euro dropped the storm next weekend, but we can’t lose hope based on one operational model. Snow map for tonight looks great to me! The next Sunday situation looks pretty impressive to me, 3-5″, maybe even a bit more if the change over is delayed or doesn’t happen at all. Then lots of cold air around and other possibilities. February is starting to look a lot like the extremely cold February a few years back, when the Potomac remained ice and snow covered well into March, the first time that has happened in over 200 years! So I am hoping that we can salvage this winter, even with its terrible first half.